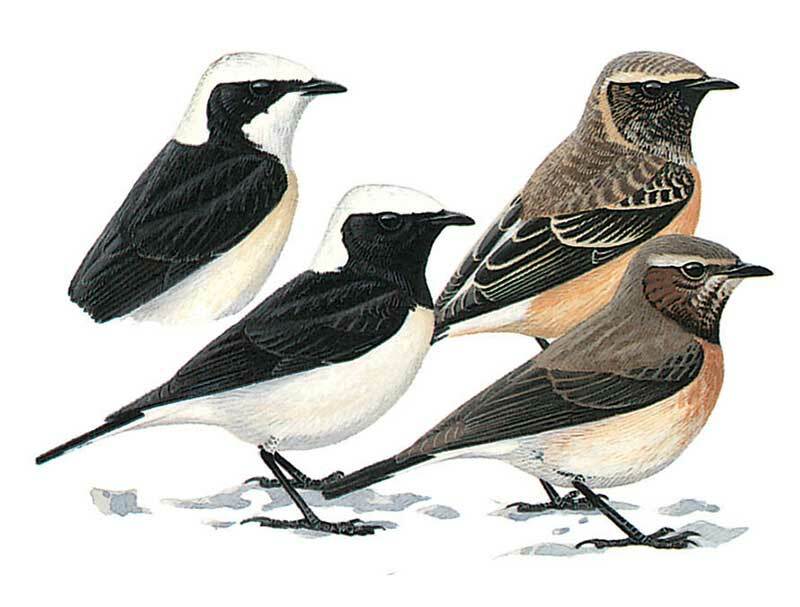 Slender, relatively long-tailed wheatear, often perching on bushes. told from Mourning by absence of white panel in open wing. Autumn male has black back and ‘bib’ fringed buffish, dark crown with buff-white supercilium, and buff underparts. Female sometimes like female Black-eared (of eastern race melanoleuca) but upperparts usually duller, cooler brown-grey; some show large dark greyish ‘bib’ in summer (absent in female Black-eared); autumn female also told from similar Black-eared by dark brown breast-sides merging with greyish ‘bib’ (in Black-eared, smaller grey ‘bib’ separated from dark brown breast-sides by pale orange-buff area). 1st autumn female told with difficulty from eastern Black-eared by colder tone above; mantle and shoulder usually scalloped with rows of pale fringes (absent or ordered erratically in Black-eared). In extremes, Pied’s slightly longer primary projection may be helpful. 1st winter female told from Northern Wheatear by much black on outer tail-feathers, creating terminal band of uneven width.